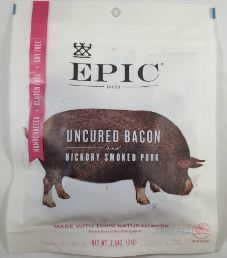 The next review on EPIC Bites will be on a 2.5 ounce/71 gram bag of their uncured bacon and hickory smoked pork flavored bites. This bag was purchased at a 7-Eleven store in East Rutherford, New Jersey. 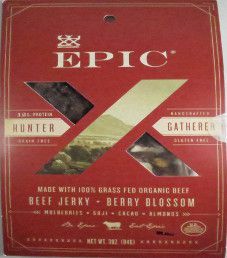 The next review on EPIC will be on a 3 ounce/84 gram bag of their Berry Blossom flavored organic beef jerky trail mix. There is a combination of jerky, berries, organic cacao nibs, and organic coconut chips. This bag was purchased at a TJ Maxx store in Virginia Beach, Virginia. 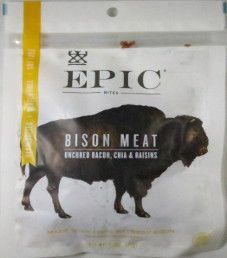 The next review on EPIC Bites will be on a 2.5 ounce/71 gram bag of their bison bacon chia flavored bites. This bag was purchased at a Whole Foods store in Virginia Beach, Virginia. 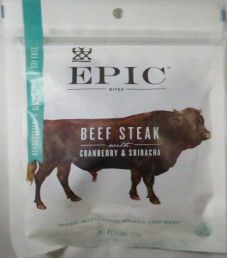 The first review on EPIC Bites will be on a 2.5 ounce/71 gram bag of their cranberry & sriracha flavored beef steak. This bag was purchased at a Whole Foods store in Virginia Beach, Virginia.